Laundry – DoubleStack Dryers | Hercules Machinery, Inc.
Continental Double Stack Drying Tumblers deliver unrivaled energy-efficiency and drying productivity per square foot. 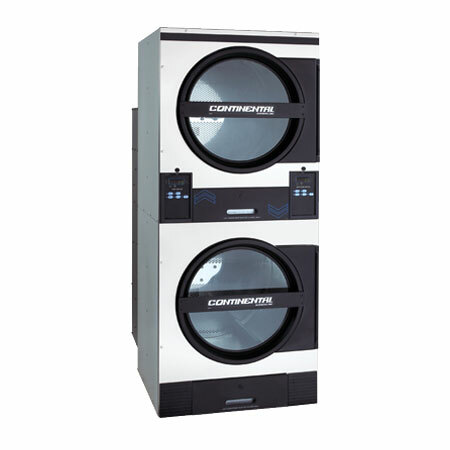 Durable constructed for longevity, these dryers offer a slim design, superior programmability, simple installation and ease of use. These dryers are designed to pack more capacity and productivity into a smaller footprint. Continental Dryers feature large lint screens for easy cleaning, and conveniently accessible components, including cylinder rollers that are easily accessed by removing the lint compartment. The location and accessibility of the dryer motors and electrical components further ease service and maintenance. The tumblers feature oversized steel doors with ergonomic metal door bars for quick loading and unloading.